The town of Cold Rock is dying, the mines have dried up and there is no money or work available. 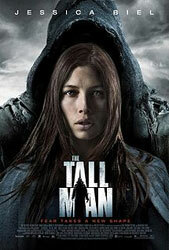 The town also host to the legend of the Tall Man, a figure who is blamed for the town’s unusually high number of missing children. Julia Denning (Jessica Biel) is a nurse, who is the only medical professional left after her husband, the town’s doctor, passed away. One night she awakens to find her house broken into and a tall darkly dressed figure running to a truck with her child in its arms. This film is beautiful to look at, making the most of the forests and mountains surrounding the town. It is difficult to discuss the plot of ‘The Tall Man’ without going into spoiler territory, but everything that’s presented to the viewer is turned on its ear, not once but twice during the movie. It’s a really marvelous bit of writing. On the downside anyone looking for the intensity or brutality of Laugier’s previous film, ‘Martyrs’ (2008) is going to be disappointed, this film isn’t about visceral shocks but more about how far people will go to achieve their goals. There are also some questionable statements about class raised during this movie which I did not expect.